The Cottage occupies the entire second floor of the same historic barn as the Loft and the Studio. The open floor plan with full kitchen and living room has three private bedrooms, 2 with one double bed in each room, and the third with either 2 twins or 1 king. It was completely renovated in 2013 with a new kitchen and 2 new bathrooms. Rooms can be rented individually or the entire Cottage can be reserved at a discounted rate and can accommodate up to 8 people. When combined with the adjoining Studio groups of up to 12 can be accommodated. 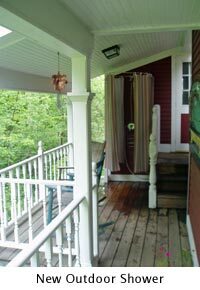 All rooms share the kitchen and living room, 2 ½ baths and outdoor brook-side shower.